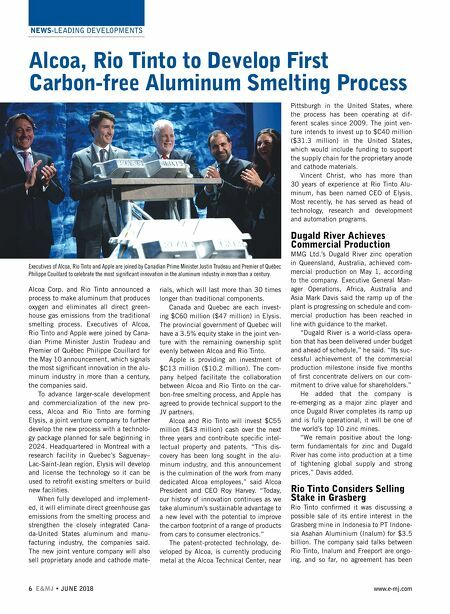 NEWS-LEADING DEVELOPMENTS 6 E&MJ • JUNE 2018 www.e-mj.com Alcoa, Rio Tinto to Develop First Carbon-free Aluminum Smelting Process Alcoa Corp. and Rio Tinto announced a process to make aluminum that produces oxygen and eliminates all direct green- house gas emissions from the traditional smelting process. Executives of Alcoa, Rio Tinto and Apple were joined by Cana- dian Prime Minister Justin Trudeau and Premier of Québec Philippe Couillard for the May 10 announcement, which signals the most significant innovation in the alu- minum industry in more than a century, the companies said. To advance larger-scale development and commercialization of the new pro- cess, Alcoa and Rio Tinto are forming Elysis, a joint venture company to further develop the new process with a technolo- gy package planned for sale beginning in 2024. Headquartered in Montreal with a research facility in Quebec's Saguenay– Lac-Saint-Jean region, Elysis will develop and license the technology so it can be used to retrofit existing smelters or build new facilities. When fully developed and implement- ed, it will eliminate direct greenhouse gas emissions from the smelting process and strengthen the closely integrated Cana- da-United States aluminum and manu- facturing industry, the companies said. The new joint venture company will also sell proprietary anode and cathode mate- rials, which will last more than 30 times longer than traditional components. Canada and Quebec are each invest- ing $C60 million ($47 million) in Elysis. The provincial government of Quebec will have a 3.5% equity stake in the joint ven- ture with the remaining ownership split evenly between Alcoa and Rio Tinto. Apple is providing an investment of $C13 million ($10.2 million). The com- pany helped facilitate the collaboration between Alcoa and Rio Tinto on the car- bon-free smelting process, and Apple has agreed to provide technical support to the JV partners. Alcoa and Rio Tinto will invest $C55 million ($43 million) cash over the next three years and contribute specific intel- lectual property and patents. 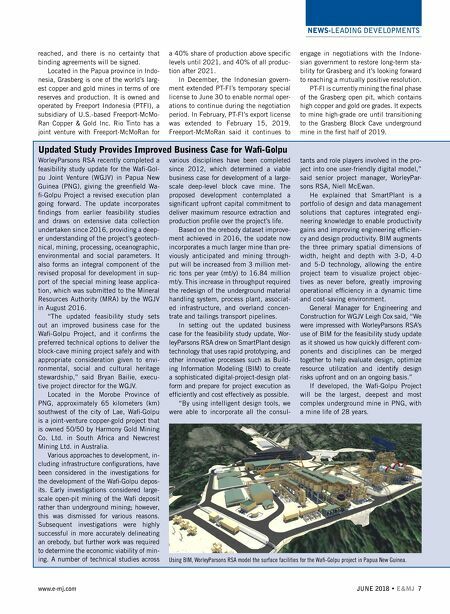 "This dis- covery has been long sought in the alu- minum industry, and this announcement is the culmination of the work from many dedicated Alcoa employees," said Alcoa President and CEO Roy Harvey. "Today, our history of innovation continues as we take aluminum's sustainable advantage to a new level with the potential to improve the carbon footprint of a range of products from cars to consumer electronics." The patent-protected technology, de- veloped by Alcoa, is currently producing metal at the Alcoa Technical Center, near Pittsburgh in the United States, where the process has been operating at dif- ferent scales since 2009. The joint ven- ture intends to invest up to $C40 million ($31.3 million) in the United States, which would include funding to support the supply chain for the proprietary anode and cathode materials. Vincent Christ, who has more than 30 years of experience at Rio Tinto Alu- minum, has been named CEO of Elysis. Most recently, he has served as head of technology, research and development and automation programs. Dugald River Achieves Commercial Production MMG Ltd.'s Dugald River zinc operation in Queensland, Australia, achieved com- mercial production on May 1, according to the company. Executive General Man- ager Operations, Africa, Australia and Asia Mark Davis said the ramp up of the plant is progressing on schedule and com- mercial production has been reached in line with guidance to the market. "Dugald River is a world-class opera- tion that has been delivered under budget and ahead of schedule," he said. "Its suc- cessful achievement of the commercial production milestone inside five months of first concentrate delivers on our com- mitment to drive value for shareholders." He added that the company is re-emerging as a major zinc player and once Dugald River completes its ramp up and is fully operational, it will be one of the world's top 10 zinc mines. "We remain positive about the long- term fundamentals for zinc and Dugald River has come into production at a time of tightening global supply and strong prices," Davis added. Rio Tinto Considers Selling Stake in Grasberg Rio Tinto confirmed it was discussing a possible sale of its entire interest in the Grasberg mine in Indonesia to PT Indone- sia Asahan Aluminium (Inalum) for $3.5 billion. The company said talks between Rio Tinto, Inalum and Freeport are ongo- ing, and so far, no agreement has been Executives of Alcoa, Rio Tinto and Apple are joined by Canadian Prime Minister Justin Trudeau and Premier of Québec Philippe Couillard to celebrate the most significant innovation in the aluminum industry in more than a century.